Shame on us for taking so long to evaluate any of the Bend Brewing Companies many fine ales. Tonya Cornett, the now famous brewmaster at the Bend Brewing Company(BBC) has recently released her seasonal amber offering, Axe Head Red. 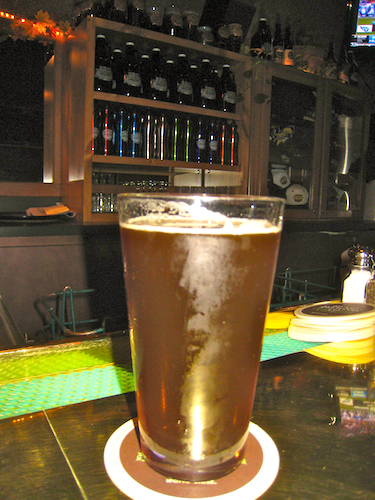 Axe Head Red ale from the Bend Brewing Company, in downtown Bend, Oregon. Axe Head Red is a big bodied medium alcohol(our guess is that it tips the scales at about 6% alcohol this year, Tonya, please correct us!) ale. Deep auburn in color, this flavorful ale hits the nose with rich nutty and caramel notes and hits the palate with more of the same. It is well balanced by an attractive yet somewhat understated hop profile. This beer is about the malt profile but it is not sweet. It is a dry full nuttiness that paves the way for this seasonal winner from the BBC. More information about the BBC’s beers can be found at their website. Bend Brewing Company. Almost as good as the beer is the service at the Bend Brewing. They maintain an amazingly stable staff filled with affable and knowledgeable servers. We’ll have more in the near future from the BBC, so stay tuned. The Bend Wild Tasting committee. Axe Head Red from the Bend Brewing Company | Bend Wild	. Will bookmark! Thanks. My link:http://mjksdct.mojblog.hr/ ,Thanks again…. Thanks. My link:http://antoniaesjohn.wordpress.com/ ,Thanks again….